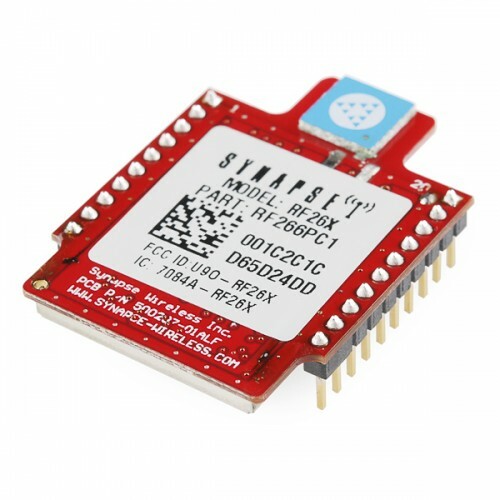 Are you a fan of the XBee form-factor but in need of more power? Try the Synapse module! The Synapse RF266PC1 is an IEEE802.15.4 RF module running the SNAP® network operating system that is pin-compatible with sockets already designed in for Digi International’s XBee® and XBee-PRO® RF modules. The RF266 also includes an open source software layer that can understand AT commands that you may already be using or you can modify the software to fit your requirements. This module supports data rates from 250kbps up to 2Mbps and distances of up to 3 miles because of a high gain 22 dBm transmit amp; a built in receive amp provides a -107 dBm receive sensitivity! These small, low-powered, 2.4 GHz transmitter-receiver modules are modest in power consumption – as low as 0.37 μA. The RF266PC1 even comes preloaded with the award-winning Synapse SNAP network operating system. The embedded Python virtual machine makes application programming fast and easy and you can send your code to the module over the air. That's right, the module can be programmed with a stripped-down Python style language and execute code on it's own, no separate microcontroller required!